Your affiliate newsletter has been sent to your affiliates, but how to you find out who is opening it? It is important to analyze such things as the open rate, bounce rate, and the individual affiliates that are reading the newsletter. I will provide a step-by-step guide to finding and reading your affiliate newsletter performance reports. 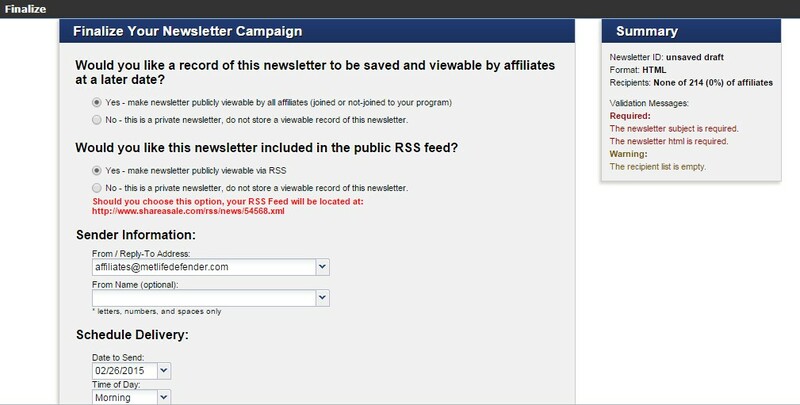 Once logged in you will need to hover over the “Affiliates” tab and click the “Send Newsletter” icon. 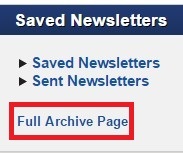 After you click on the “Send Newsletter” icon you will need to scroll down and click the “Full Archive Page” link. The link will take you to a page where it will show you all your previous newsletters sent. This section will show you every single newsletter sent along with other pertinent information including: newsletter ID, the send date, how many affiliate it was sent to, the option to view the newsletter, and report. For the purpose of this post we are going to click on “Report”. Here is the data for each newsletter you chose. The rectangle box at the top will have the entire selection of available newsletters that have performance data. I removed all the sensitive information from the image, but you should see a few choices (if you have sent them in the past). The information provided below provides exact numbers of opens, the open percentage, bounces, the bounce percentage, and the individual affiliates that opened the newsletter. To find out who the affiliates are that opened it simply click the “plus sign” (red square). Why are affiliate newsletter open rates and bounce rates important? They help in determining the best method to communicate with affiliates as well as the best times and days. The bounce rate could be a combination of invalid email addresses, mailboxes full, etc. To determine the best day and time to send affiliate newsletters we recommend A/B testing. Send a newsletter out on different days of the week, at different times, with different subject lines. Once you have completed the tests, simply review the data, learning from your successes, and constantly refining how you handle your future mailings. Affiliate newsletters are an important component in managing relationship with your affiliates. Communicating with your affiliates is extremely important to keeping them engaged and active. Newsletters should have a personal touch and provide affiliates with information they can use to further promote your products. In January I wrote a post on writing effective newsletters, but today I am going to show you how to send a newsletter through the ShareASale interface. I will provide a step-by-step guide to this very important, but sometimes overlooked piece. After you log in to your ShareASale merchant account, hover over the “Affiliates” tab and you will see a “Send Newsletter” icon (looks like a stack of newspapers). Click the “Send Newsletter” icon. When I send newsletters out for clients I use the HTML option because it allows me to create a robust newsletter with images and clickable links. The split campaign option is available when you want to maximize your open rate. By default is provides a list of ALL affiliates to send to, but if you do not want to send it to all affiliates ShareASale allows you to search affiliates in many ways including: groups, tags, commissions earned, clicks, country they reside in, or even past newsletter recipients. Once you determine who is getting the newsletter you will see them in the recipients section to the right. This is the section where you actually compose your newsletter. For this articles purpose I have chosen the HTML format. You must enter a compelling subject line (you want affiliates to open it) and the body of the newsletter. 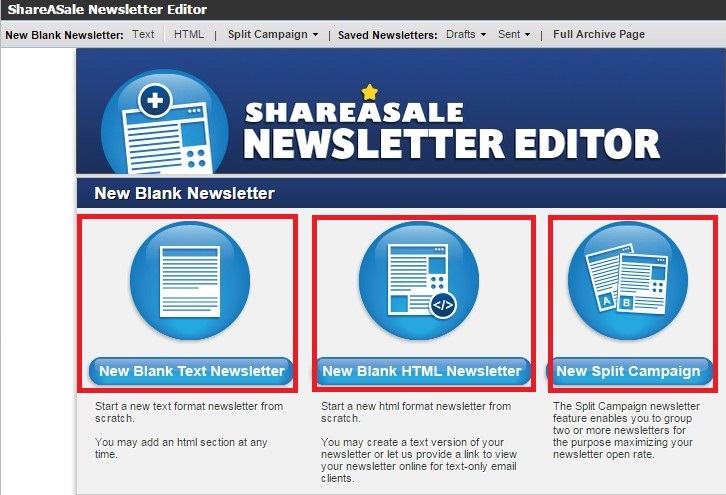 ShareASale offers ways to customize and personalize newsletter using Macros. You can insert a Macro and have the affiliates name automatically populate when it is sent to them and also include specific creatives that will embed the affiliates ID automatically. Once the subject line and body of the affiliate newsletter are complete you can preview it and make sure it is formatted the way you want and it is mistake free. In this step you can send a test to yourself to make sure all is good. This is the final step before the newsletter is sent to your affiliates. To the right you will see a summary that will include any items that need your attention. The ones that require your attention will be in red. Here you will choose a From/Reply-to address and the delivery date and time. You have the option to schedule it, but not for a specific time, only certain times during the day. Please note that Friday’s are not a recommended day to send newsletters. There you have it, a guide to sending an affiliate newsletter through ShareASale. Like many of the other tasks in ShareASale it is straight forward. Next week I will show you how to locate affiliate newsletter open rate information.